1. 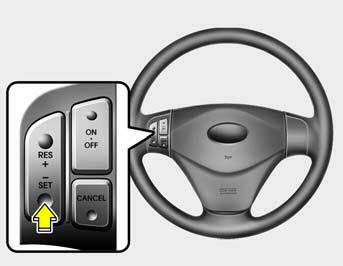 Push the CRUISE ON-OFF button on the steering wheel to turn the system on. The CRUISE indicator light in the instrument cluster will illuminate. 2. Accelerate to the desired speed, which must be more than 25 mph (40 km/h). 3. Push the -/SET switch, and release it at the desired speed. The SET indicator light in the instrument cluster will illuminate. Release the accelerator at the same time. The desired speed will automatically be maintained. On a steep grade, the vehicle may slow down or speed up slightly while going downhill. On steeper hills, with a Manual Transaxle, the cruise control may be unable to maintain the set speed. The driver should downshift as necessary. Press the "RES/+" button to resume the cruise control at the set speed in the new gear. After cresting the hill, upshift, and press the "RES/+" again. If the speed drops ~ 9 mph below the set speed, the cruise control will cancel. 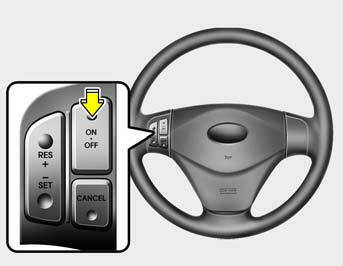 If it cancels, shift to the appropriate gear, and press the OMC039301 "RES/+" to resume the cruse control.